This Rear Lens Cover & Camera body Cap has two parts; the camera body cap is used when storing your camera body or after the lens has been removed from your camera body. It helps to keep your camera mechanism free from dust. 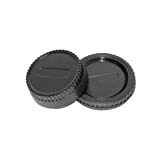 The other part, the rear lens cap, is used when storing your lens or after the lens has been removed from your camera. It helps to keep dust from your lens mechanism. This set of body cap and rear lens cap is made of high quality material, and fits for all Nikon DSLR and NIKON AF AF-S AI Lens. This entry was posted in Discount Photography and tagged Body, Camera, Cover, D100, D200, D300, D3000, D300S, D3100, D40x, D5000, D700, D70s, lens, Nikon, Rear by Ball Photo. Bookmark the permalink.